Mauchline – pronounced ‘Moch’lin’ – is a small town around 11 miles (18 km) inland from the Scottish coastal resort of Ayr, famed for its production of small but beautifully-made wooden souvenirs and gift ware. While these types of handicraft were produced elsewhere in Scotland (particularly Lanark), it was the dominance of the Mauchline firm W & A Smith from the early 19th Century to the 1930s that has led to the vast range of wooden souvenirs produced in south-west Scotland being called by the generic name of Mauchline ware. Mauchline ware was not only popular in Britain, it was exported in significant quantities to Europe, North America, South Africa and Australia. The wood generally used for the production of Mauchline ware is sycamore, which has a very close grain and a pleasing colour. Early snuff boxes were hand-decorated either in coloured paints or in pen and ink work. Later transfer prints were used – although the exact date of their introduction is not clear they were certainly in use between 1850 and the end of production in the 1930s. Mauchline ware decorated with photographic prints started appearing in the mid-1860s. Other decorative styles were Tartan, fern and lacquer (black lacquer ware appears to be linked to the death of Prince Albert in 1861). The William & Andrew Smith factory in Mauchline, known locally as the Box Works, was badly damaged by a fire in 1933. It marked the end of production and the site is now occupied by a fire station. 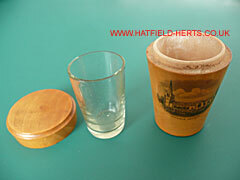 Shot glass and Mauchline ware container – possibly dating back to the days when Hatfield was the first stop from London on the stagecoach. 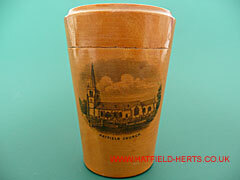 Container with the glass enclosed – showing the transfer print of Hatfield Church (St Etheldreda's) on the front. The steeple, re-erected in 1847 to mark the visit of Queen Victoria and Prince Albert the previous year, was removed in 1930. 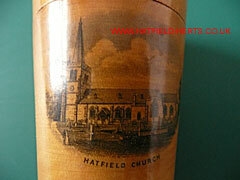 Close up of the Hatfield Church decoration – this type of souvenir ware was probably sold in shops on Fore Street.